Since its inception during the Crimean War, the Victoria Cross has been Britain's – and many of her Commonwealth allies – top award from bravery. Given the number of countries involved, it probably is the world's most famous medal. Some of the heroes who won this ultimate honour have connections with Hatfield. During WWII, the de Havilland DH.98 Mosquito played a role in the story of a number of the Air VCs. The Crimean War (October 1853 - February 1856) which saw Britain, France and the Turkish Ottoman Empire pitted against Russia was, like most major conflicts, a milestone in history. It also showed the impact of the media and public opinion on war. For Britain, in particular, it marked the creation of the nursing service (with the rise to fame of Florence Nightingale and Mary Seacole), the ill-fated Charge of the Light Brigade at Balaklava (also spelt Balaclava), and the creation of the Victoria Cross. Thanks to the growth of newspapers and despatches from correspondents at the front the general public were better informed about what was going on during the Crimean War then in any other foreign war before then. Prior to the Crimean War it was unusual for anyone below the Army rank of major (or the naval equivalent) to be awarded a medal for bravery. However, during the Crimean War, the Distinguished Conduct Medal (DCM) was created for Non Commissioned Officers (NCOs) and other junior ranks (in 1853 according to some sources, 1854 according to others). Pressure mounted for an overall gallantry award that could be awarded without regard to rank or length of service. The then Secretary of State for War, Henry Pelham Fiennes Pelham-Clinton, 5th Duke of Newcastle under Lyme, wrote to Prince Albert about it on 20 January 1855. He later told the House of Lords that the Government had advised the Queen to institute 'a Cross of Merit'. Ultimately, the Civil Service came up with some proposals. Prince Albert intervened to change its name from 'The Military Order of Victoria' to 'Victoria Cross'. While Queen Victoria chose the design and the inscription on the front of the medal. 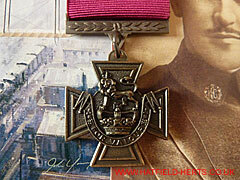 The Victoria Cross has the shape of a maltese cross with another maltese cross inscribed within. As can be seen from the picture above (which is of a full-size replica) the medal features Queen Victoria's arms on top of a motto scroll bearing an inscription. The Victoria Cross initially had either a 1.5 inch (38.01mm) red or blue ribbon depending on whether the person receiving it served in the army or navy. As the Wright Brothers only made the first aeroplane flight nearly half a century later there was no air force to consider at that time. However, after WWI, it was decided to use the Army crimson ribbon as standard for all armed services. Although it is interesting to note to the first air VC, awarded posthumously during the conflict, had a crimson ribbon. Early medals, particularly those honours exchanged between members of European royal households, were often elaborate pieces of jewellery. There was some consideration given to making the Victoria Cross out of gold or other precious metal but it was decided to make it from bronze instead. The actual bronze used has long been believed to be from the cascabels (the round ball of metal at the closed end of a cannon) taken from two Russian cannons captured at Sebastopol, during the Crimean War. However, there are claims that this was not always the case. From the outset Victoria Crosses have been made by Hancocks and Company, a jewellers initially based in Mayfair but who later moved to Piccadilly, where they remain today. A Victoria Cross is 1.375 inches (34.93mm) wide and weighs 0.87 troy ounces (27.06 grams) with the laurel leaves-decorated suspended bar and v-shaped link (Victorian Britain took a lot of inspiration from Greece and Rome – in ancient Greece wreathes made from laurel leaves were used to fete heroes). In the original design proposals the inscription on the front read 'For the Brave'. However, Queen Victoria decided that this might be interpreted as a slight to those servicemen who had not received it and had it changed to 'For Valour'. The Victoria Cross was officially 'launched' through a Royal Warrant of 29 January 1856. The warrant contained 15 conditions or statutes relating to the new award. These would be modified, altered or added to over the years. 24 February 1857 – First awards of the Victoria Cross are published in the London Gazette. 26 June 1857 – Queen Victoria personally invests (awards) the Victoria Cross to 62 of the 111 Crimean War recipients at a public ceremony at Hyde Park in front of 4,000 troops and an estimated 12,000 spectators. 10 August 1858 – Royal Warrant enables the Victoria Cross to be awarded to 'non-military' people. This leads to four awards for voluntary service during the Indian Mutiny. 1 January 1867 – Royal Warrant extends eligibility for the Victoria Cross to include local forces serving with 'Imperial troops' under the command of a general or other officer. 23 April 1881 – Royal Warrant effectively cancelled the August 1858 warrant and emphasised its military nature by requiring it to be for 'conspicuous bravery or devotion to the country in the face of the enemy'. 6 August 1881 – Royal Warrant extends eligibility for the Victoria Cross to include members of the Indian religious establishments accompanying Empire forces in the field. 1899-1902 Boer War created a controversy that was to have a major impact on the Victoria Cross. Up to this point it was only awarded to living recipients. However, a decision to award it posthumously to the Hon. Frederick Roberts, who was fatally wounded at the Battle of Colenso on 15 December 1899, was seen as favouritism – due to his father being Field Marshal Earl Roberts VC (awarded in 1858). The uproar led to a further six posthumous awards, which created a precedent for posthumous awards. 21 October 1911 – Royal Warrant extends eligibility for the Victoria Cross to include native officers and men of the Indian Army (ie. non-Europeans). 20 May 1920 – Royal Warrant standardises the crimson ribbon for all branches of the armed forces. 26 July 1920 – Letter from King George V made known the sovereign's wishes that, once awarded, a Victoria Cross should not be cancelled. Under the original terms holders had to be of 'good character', and between its inception and 1908 eight men had their Victoria Crosses revoked for various reasons. There appear to have been no major changes to the award for the next 70-years. 15 January 1991 – HM Queen Elizabeth II approves the Letters Patent for an Australian version of the Victoria Cross. The medal and ribbon are identical to the original Victoria Cross. At the time of writing (February 2011) it has been awarded only twice – in 2009, to Trooper Mark Gregor Donaldson of the Australian SAS for services in Afghanistan; and in 2011, to Corporal Benjamin Roberts-Smith, also of the Australian SAS for services in Afghanistan. 2 February 1993 – HM Queen Elizabeth II approves the Letters Patent for a Canadian version of the Victoria Cross following a formal request by the Canadian prime minister on 31 December 1992. The award is identical except the inscription has been changed from the English 'For Valour' to the Latin 'Pro Valore' presumably in response to French Canadian sensibilities. 20 September 1999 – Creation of the Victoria Cross for New Zealand. The medal and ribbon are identical to the original Victoria Cross. At the time of writing it has been awarded only once – in 2007, to Corporal William Henry Apiata of the NZ SAS for services in Afghanistan. 15 December 2006 – the last British Victoria Cross at the time of writing was gazetted as a posthumous award for Corporal Bryan James Budd (25048092) of 'A' Company, 3rd Battalion, The Parachute Regiment. Corporal Budd was killed in action in Afghanistan. Note 10.11.12: 1 November 2012 – Corporal Daniel Keighran, 6th Battalion, Royal Australian Regiment, was presented with the Victoria Cross of Australia for heroism when his patrol was attacked in Afghanistan on 24 August 2010. This was the third Afghan VC of Australia awarded for operations in Afghanistan but the first to go to a member of the regular army ie. not Special Forces.